A fertilizer is a substance applied to soil to enhance its ability to produce plentiful, healthy plants. Fertilizers are natural and manufactured chemicals containing nutrients known to improve the fertility of soils. 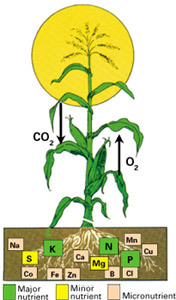 Nitrogen, phosphorus, and potassium are the three most important nutrients for crop growth; some plant scientists think sulfur is also a major nutrient because of its benefit to plant health and growth. This fact sheet examines these and other nutrients that are found naturally in soils.